I'm not sure about you but since I started blogging more than four years ago I don’t leave home without my camera. I've taken thousands of photos and sadly most of them will never see the light of day. While I don't have any trouble taking pictures of inanimate objects, people on the other hand are a whole different story. Especially moderately famous people whom I would never expect to strike a happy pose (mostly because they are usually running away from me with a look of terror on their faces). While my ‘star stalking’ has improved somewhat since I made a complete fool of myself by chasing a famous artist around a book sale a couple of years ago, I still apparently have a long way to go. First, it takes me ages to reconcile that the person in front of me is actually the person I think it is. I then usually yell loudly to the person next to me to seek confirmation as to whom I think it is. "Oh my god, oh my God, that's Kenny from that hilarious film and the Jenny Craig ad isn't it?" Then I eventually delve into my handbag (which is dangerous in itself) to find my camera. 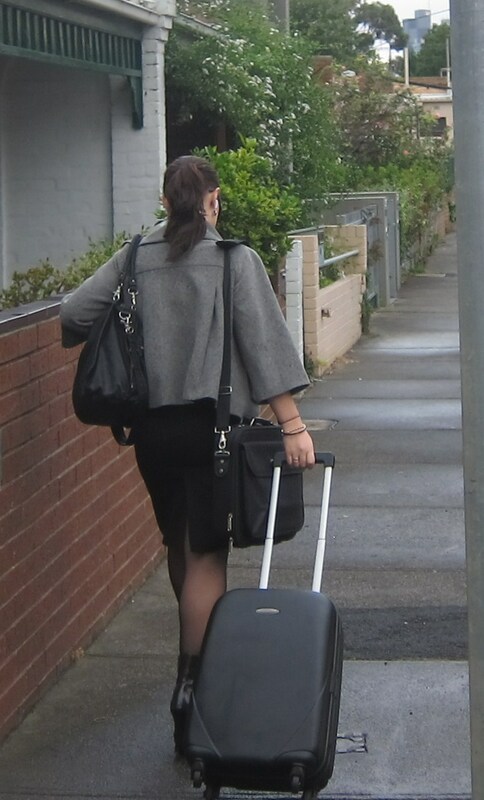 By the time I press click I usually only manage to get a lovely view of the person's back. 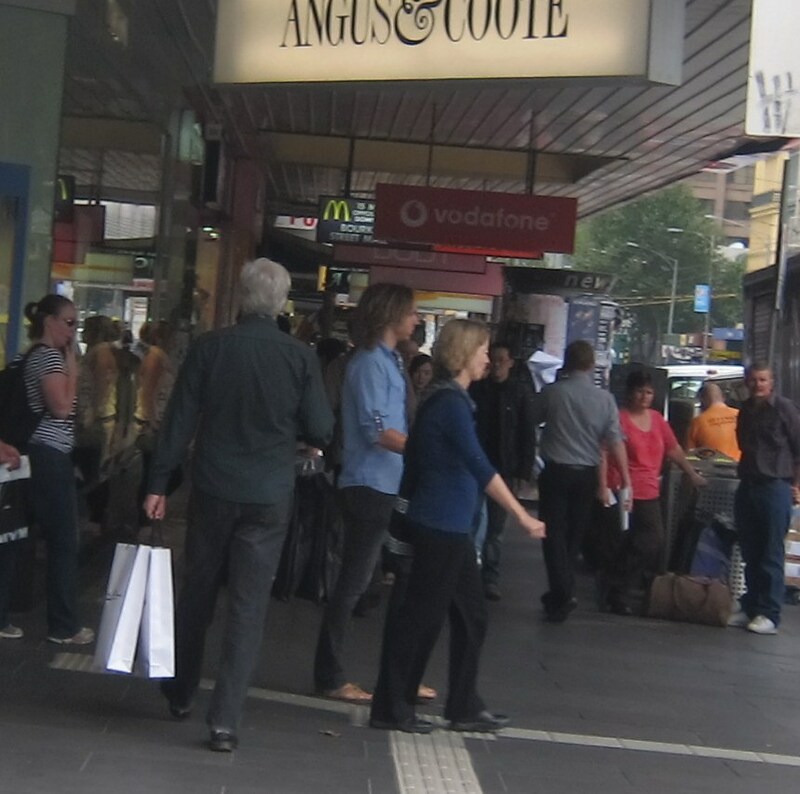 Actor/writer/comedian, Shaun Micallef (with grey hair) shopping in Melbourne. It could be anyone right? You are just going to have to have to trust me. Maybe in another couple of years I will manage to get faces in the picture that you can actually recognise and give the paparazzi a real run for their money. I wouldn't hold your breath though. How about you, since you started blogging have you taken lots more photos?What have you done with them? lol, Lilly, frustrating! I've always taken lots of photos, they are now digital and not very organized. Oh My God....I've taken thousands...And lots and lots of them have seen the light of day on my blog. But then, I always have taken lots and lots of pictures. But, the thing that is so great since blogging, is that I can download these pictures and see them in a heartbeat...! This is a Miracle, to me! INSTANT GRATIFICATION...no waiting for the film to be debeloped, etc....We live in an Amazing time, don't we? As to recognizing your "stars"...in truth, I don't know who they are to begin with...lol....But I urge you to keep at it, my dear. I'm sure you will get better and better at capturing people---the more you do the better you will be. Oh I certainly have taken more photos and used them on the blog. But I still don't typically have my camera at the ready. I have rarely seen celebrities and might not recognize very many. I did see Former President Nixon at the Shannon airport in Ireland once. 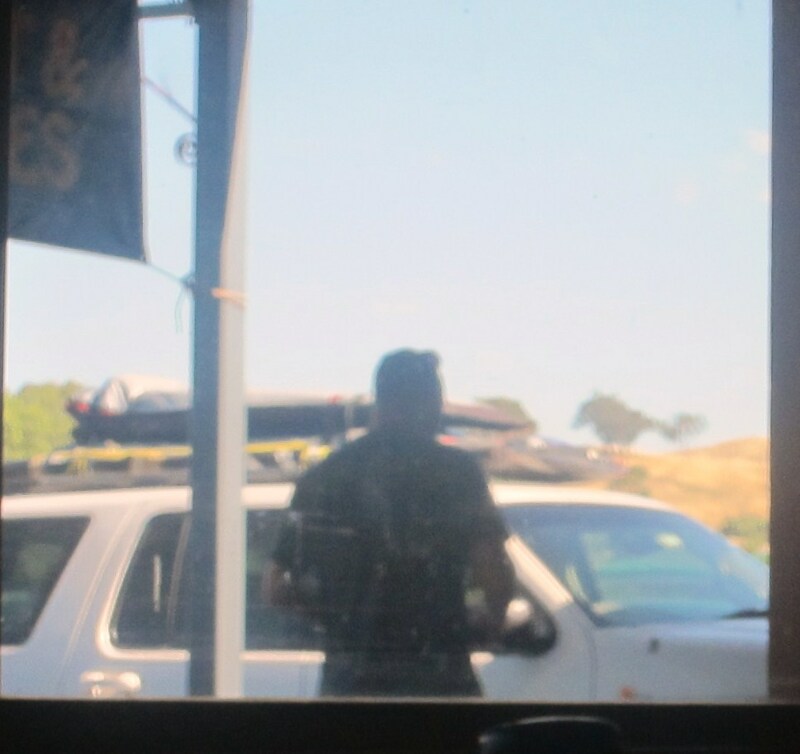 Actually I heard his voice and looked up and there he was buying some souvenirs. I'm not paparazzi. Maybe blogazzi? Hey next time you're passing through let me know I'll smile at the camera. Well...gosh! At least you've got their backs. I haven't seen any star worth stalking over here. I'm willing to keep my eyes open though. As for my photos, I take a TON of photos now for my blog which gather cyber dust in my computer. I started taking photos to try to put photos on my blog but mostly I don't end up using them. I either buy Istock images or just do a blog with no photo. I know that's not proper form but agonizing over photos sends me over the top. It is something I plan to conquer and I do like having the camera with me to record some things that just need to be recorded. Glad to have you back blogging with your very special Lilly humor, wit and wisdom. I bought a camera after starting a blog. I love taking pictures of trees, and clouds, and leaves. I know, maybe one of these days I will advance to pics of people! Great to have you back. Hugs to you. I'm blogging in arrears, using photos I already have. Glad to see you are back to blogging! LOVE the way you refer to Blogger crash as maintenance! Priceless. In the Minneapolis/St. Paul years ago my daughter and I recognized Keanu Reeves ... the exact week he was on the cover of People magazine. (With my daughter crouching in the background) I approached him where he sat reading a paperback - all alone and gorgeous. He didn't have to acknowledge me, he could have been rude ... neither happened. He was most gracious, autographed my People mag and talked to both of us for quite some time. Believe it or not, I did not have a camera with me and my cell phone was ancient. I have amazing photos from the 1984 Olympics in Los Angeles.